Some of the largest commercial laboratories in North America and South America count on resources and expertise from Laval Lab, our understanding of the policies and procedures for accreditation required by a commercial laboratory, and our knowledge of the instrumentation required. 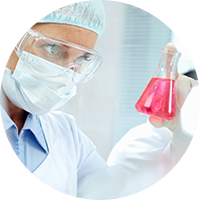 Laval Lab is in a position to propose laboratory equipment, and specialized chemical products, that meet these strict standards and is still financially viable. Laval Lab has over 30 years of experience offering products and services to both private research and commercial application laboratories, particularly those in the mining and metallurgy sectors. Our supplier base is extensive, comprising of manufacturers that set the standard in their domain. We offer a complete range of high quality laboratory testing and sample preparation equipment. In addition to the crushers and grinders required for milling the sample, sample dividers and sieve shakers for particle size analysis, and sample preparation equipment for XRF analysis, Laval Lab also offers a complete line of accessories and complementary products and services that might be required. Our representative offers technical support for the life of the instruments we supply. Laval Lab facilitates innovative improvements to the laboratory equipment we supply, in collaboration with our suppliers, based on feedback from the private research laboratories and commercial application laboratories, so it could be manufactured to meet regulatory standards in North America. For the commercial testing laboratory, we understand the need for meticulous attention to detail (such as customer specific lot numbers for chemicals supplied), timely processing and delivery as well as technical support and new product training when required. With our broad base of experience we can offer support to commercial laboratories working in sectors ranging from mines and metallurgy, to those specialized in environmental research and the chemistry industry. Laval Lab is an invaluable resource for information during planning and purchasing, and our support continues during installation, training and after-sale service. We work together with our clients to deliver cost-effective, quality solutions. Provide a rigorous monitoring of each request and an impeccable after-sales service .